Custom honeymoons and luxury travel planning that's 100% free, always. When wifey proposed the idea of visiting Japan, my first thought was, “We’re flying business class, right?” I mean you have to fly business class if you’re traveling that far. Wifey’s response was, “Duh!” Yup, we’re soulmates. About a year ago, we noticed that American Airlines was about to increase their award redemptions, meaning the mileage required for an award ticket was about to go up. For example, you could previously fly business class to Asia for about 50,000 miles. Currently, that number is 60,000 for a one-way ticket. We’re not about that life. I had been wanting to open up a Chase Sapphire Preferred for quite some time. If you’re a traveler and you don’t have one of these cards, you need to get one as it offers 2 points per dollar on all travel and restaurant purchases. With the Chase Sapphire Preferred, when you spend $4,000 in the first 3 months, Chase will give you 50,000 bonus miles. We then also decided to spend about $2,000 to buy American Airlines miles with an awesome promo that provided a major discount on miles + about 75,000 bonus miles. 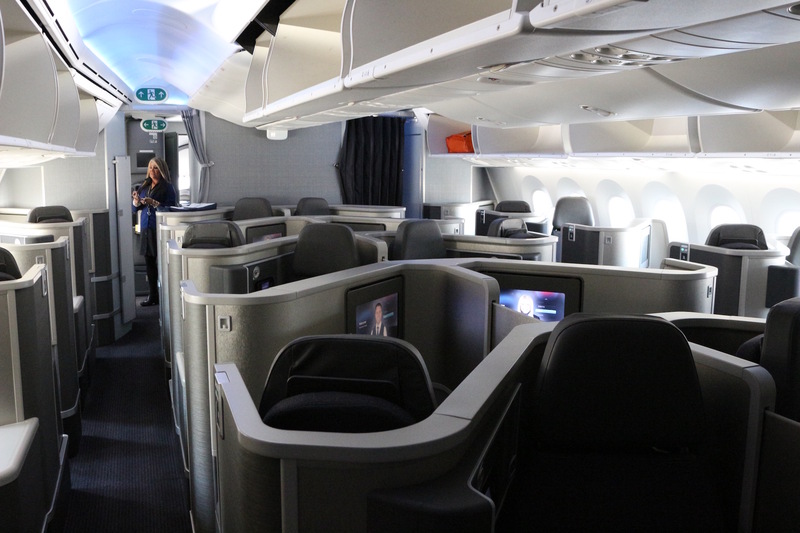 Therefore, we parlayed the purchase with our Chase Sapphire Bonus to basically earn 2-for-1 business class flights. 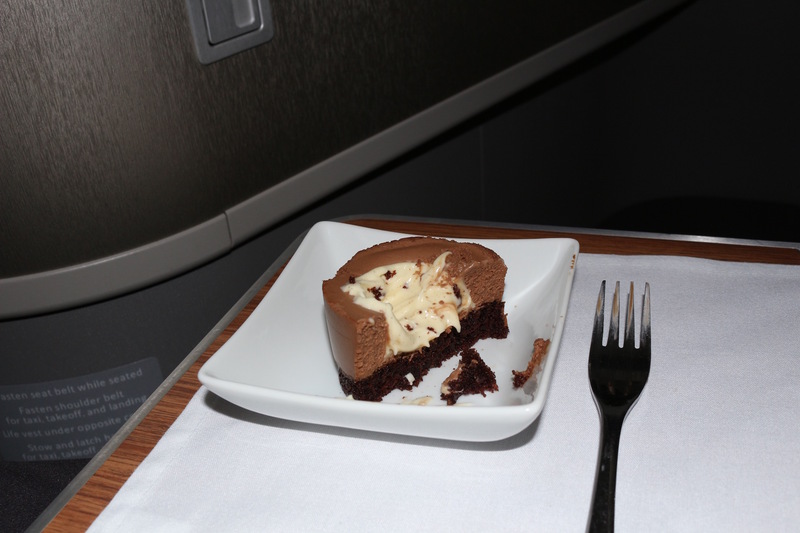 We used the chase points to book our return flight on Singapore Airlines’ outstanding first class. 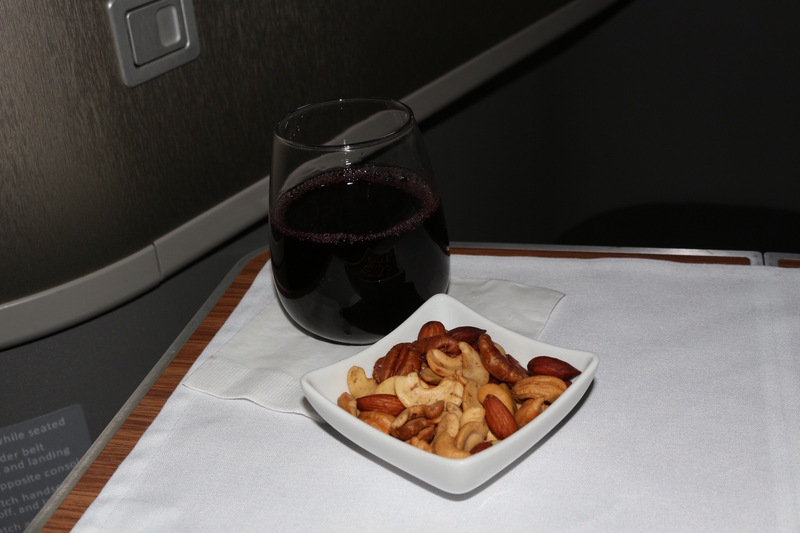 For other tips on how to fly business class for free or cheap, click here. Anyway, we purchased the miles and began searching for our Business Saver Award flight to Japan. 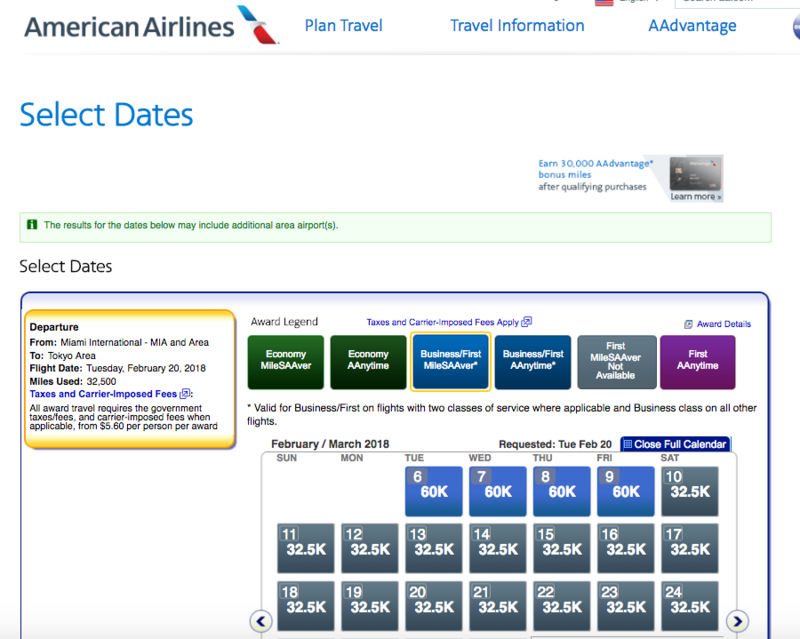 American Airlines allows you to see award redemptions about 330 days out. With the award devaluation quickly coming, we decided that March 2017 would be our target for our Japan trip. Insider secret: As long as your origin and destination cities stay the same, you can change the dates of your trip as many times as you want, provided that your departure date doesn’t exceed one year from the original date of ticketing. Finally, the March dates opened and we grabbed two business class tickets to Tokyo on March 17. After a quick flight from Miami to Chicago on AA’s refurbished 767-300 in First Class, we were ready for our long haul flight. I don’t have a lot of positive things to say about the Admirals Club in Chicago. To be completely honest, it was disgusting. It is my understanding that the lounge is currently undergoing renovations. Therefore, because a large portion of the lounge is blocked off the remaining patrons are stuffed in the very small open area. The lounge felt stuffy, overpacked, and was not an enjoyable experience. Had the lounge access not come complimentary with our business class ticket, I would be adamant about getting my money back. We also noticed that this lounge did not offer free drinks and instead, provided two drink tickets. On previous trips, full drink service was provided. Tip to AA: Close the Admirals Club during renovations if that’s the experience you’re going to provide. We did a ton of research to figure out which would be the best seats for our 12+ hour flight to Japan. We were excited to fly on AA’s brand new 787 Dreamliner, but soon learned that the 787 falls short of the 777 in seating. 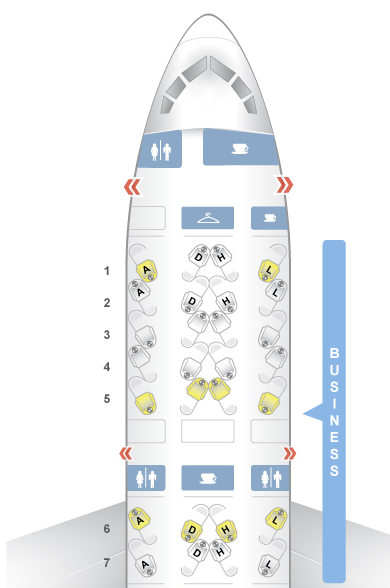 For some odd reason, AA’s 787 seats are set up in a reverse herringbone fashion. This means that your seat is connected to someone else’s seat and every other seat will either be rear or forward-facing. If you stand up at your seat, you’ll basically be looking directly at your neighbor. After careful research, wifey and I came to the conclusion that in order to get the best sleep (apparently the connected seats allow you to feel all your neighbor’s movements), we would have to sit in solo window seats away from each other. The only seats on this plane not connected to other seats are windows in row 1, 5, 6 and 7. Wifey chose seat 5A, while 5L would be my home for the next 12+ hours. 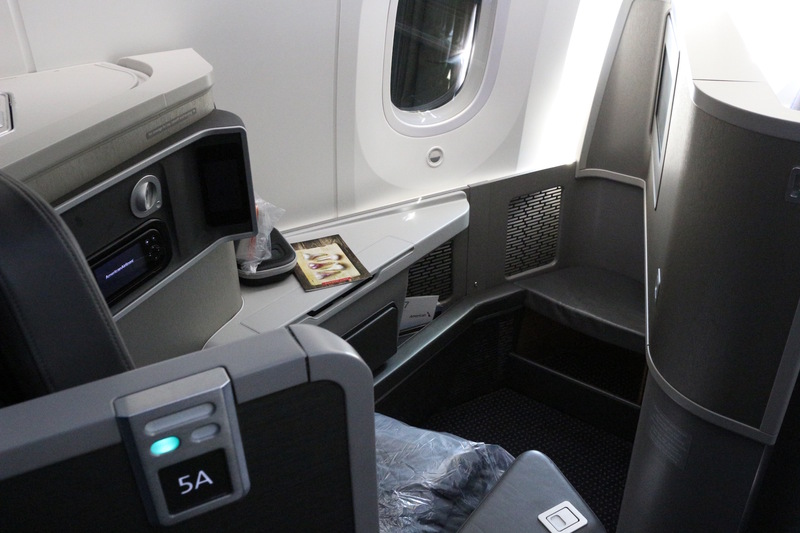 The AA 787 itself is a beautiful plane with business class set up in the modern 1-2-1 style. Being that the plane was new, I didn’t see any noticeable wear and tear on the seats. The amenities are the same as the 777, including a TV stocked with games, movies and live TV. The seat sports dimensions of a 61” pitch (77″ pitch as fully flat) and 26″ width. Our seats were in the forward section of the business class with a bathroom and a snack bar separating the smaller rear cabin. The seat in its upright position was quite comfortable with plenty of legroom. A built in remote controlled all the seating positions which allowed a full recline to the lie-flat position. On other business class flights the foot hole can be quite small, which makes laying flat feel pretty uncomfortable. Although the seat is a bit narrow, I luckily sleep on my side and was able to sleep well for about 6 hours despite some turbulence. After boarding, the flight attendants came around with amenity kits, menus, slippers, and champagne. As this flight was making its way to Japan there was a mix of both Asian and American flight attendants. Because my wife was sitting on the other side of the aisle, she occasionally popped over to say hi. But, since some passengers face backwards, the man in front of me had a bird’s eye view of my wife each time she stopped by. And he was not having it. I guess this guy thought that wifey was an economy passenger that kept sneaking into our cabin, and reported feeling “very uncomfortable” to multiple flight attendants. The flight attendant told the gentleman that my wife was also a business class passenger and was entitled to roam about the cabin freely as long as the seatbelt sign was not on. Needless to say, this made the rest of the flight a bit awkward. Appreciated how the flight attendant handled this situation, though. After takeoff, meal service began. The flight attendants came around for drink orders and appetizers. For an appetizer, we were given goat cheese lollipops. Three small goat-cheese balls were fixed to pretzel sticks and covered in sunflower seeds. The best part of the app was when I used the cheese ball and stuffed it into a fresh baked roll to make a little sandwich. The pretzel stick was cold and soft so the stems to the lollipops were quickly discarded. Next, the salads arrived. The salad was comprised of mixed greens, tomatoes and feta cheese. Despite not being a huge fan of mixed green salads, I really enjoyed the tomato caesar dressing. 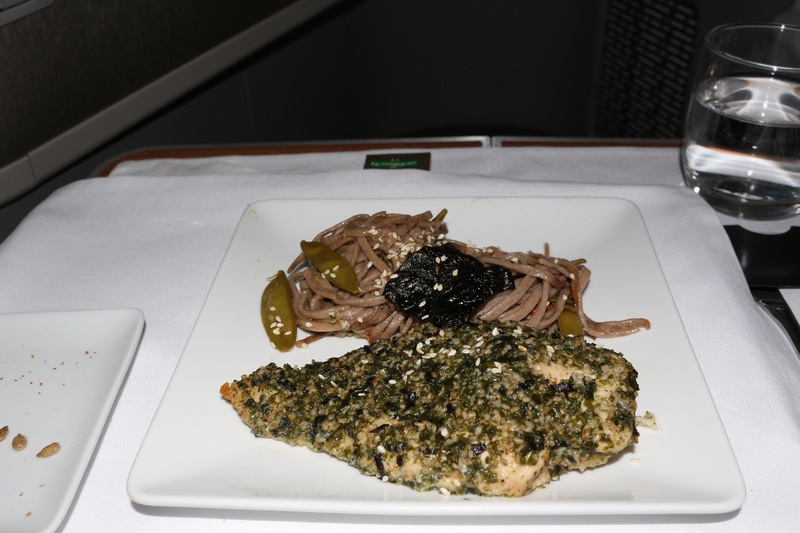 For the main course, I selected the Nori-Crusted chicken. The chicken dish was one chicken breast accompanied by soba noodles and sugar snap peas. The chicken was cooked nicely, but I really didn’t care too much for the nori crust. This meal fell a bit short of my expectations. I wouldn’t recommend this dish to other flyers. The best part of the meal was definitely the dessert. The molten chocolate cake was light, gooey and simply delicious. I found the wine selection a bit “bleh” with only a few options for red and white wine. If you’re a wine drinker, you’re not going to be impressed with the variety or lack thereof. Of course, spirits and beer can be had. However, I encourage avoiding the hard stuff in order to avoid mid-flight hangovers. There was no shortage of newly-released movies on this flight. I looked forward to seeing Doctor Strange and Arrival, and was able to watch both before taking a 6-hour snooze. Each seat is provided a pair of noise-cancelling Bose headphones, so there is no need to worry about bringing your own. 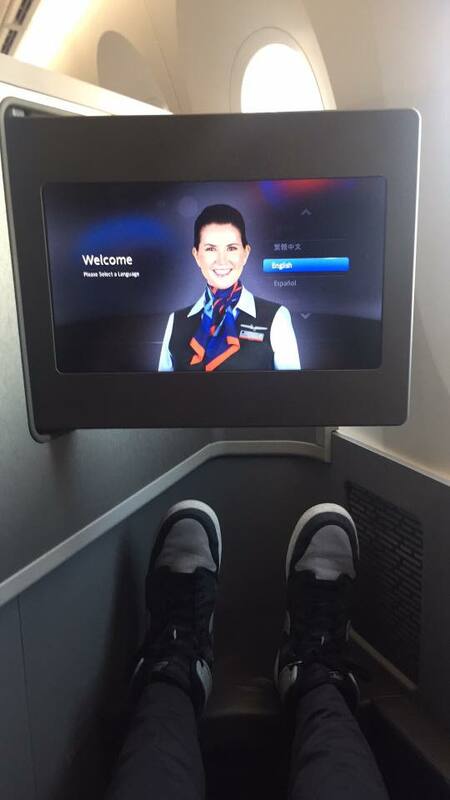 I throughly enjoyed my experience on the 787-8. 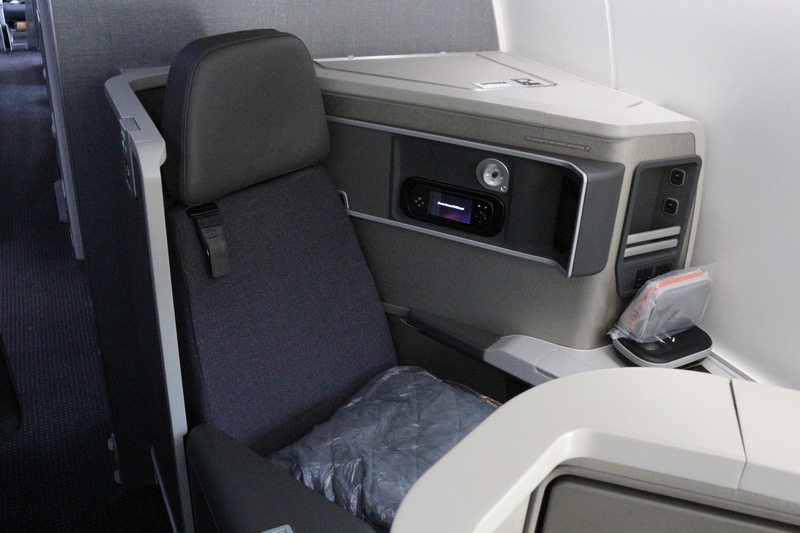 It’s still very strange to me why American decided to design the cabin in a reverse herringbone seating arrangement, but during the flight it really was not a problem…. despite the gentlemen throwing shade our way for my wife’s visits. I woke up with about an hour and 30 minutes left in the flight. When we arrived to Japan, I was excited and pretty-well rested! 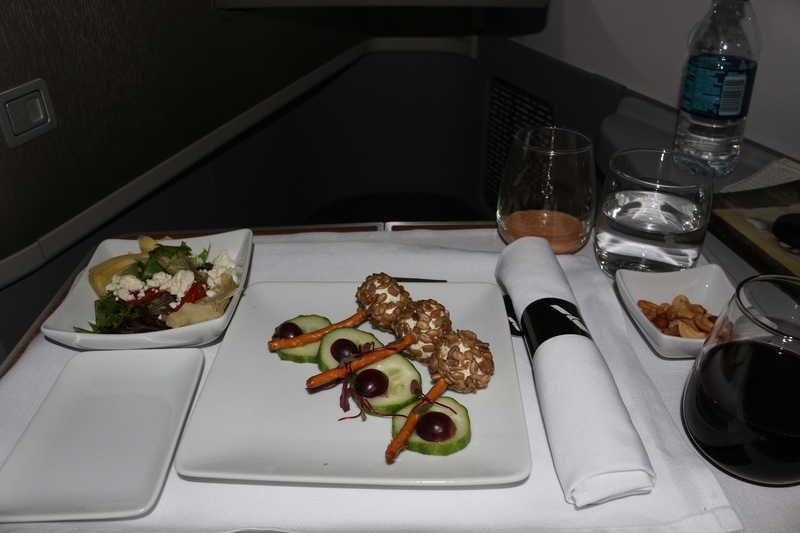 There’s not much more you can want from a business class flight.